The Psych world is quickly becoming a different place. 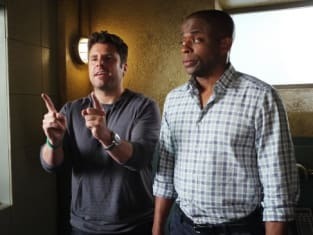 From new careers to growing families, the landscape may be changing, but one thing stays the same: Shawn, Gus, Juliet and Lassiter are still a top notch team inside and outside the line of duty, as Psych Season 8 Episode 2 swiftly reminded us. I think we could all see from the promos that Lassiter has been demoted to beat cop in light of the shake up in personnel courtesy of Trout in Season 7 Episode 14. But it's clear - or at least it was at the outset of the episode - that Lassiter still thinks of, and conducts himself, as head detective... and will stop at nothing to nab a perp. Or at least he was until he found out he will soon be a father! Even from season 1 we knew Lassiter wanted a family. Another clue a family could be next for Lassiter was alluded to in Season 7 Episode 8 when Shawn and Juliet were planning to get Lassiter a dog in order to quell Marlowe's apparently strong desire to have a child. Since that was in the reality where Shawn kept his secret, we know Lassiter never received the aforementioned pup, leaving the opportunity wide open. I think he will make a great dad, but I do have to question whether or not "Little Lassie" will, in fact, be a boy as he repeatedly remarked throughout the episode. Wouldn't it be the best twist that his new bundle of joy be a little girl?! Either way, the news clearly had a profound and almost baffling impact on his behavior. A man who never shied away from going in hot to any situation was overly cautious and ignoring his better judgment. I love that a single comment from someone they were questioning changed his entire outlook on his situation. He will make the world safer for his "Little Lassiter" and do it in the most epic way possible; his showdown at the end is proof of that. And I suspect Interim Head Detective O'Hara will be right there to help him do it. Three cheers for her moving up in the organization, even on a temporary basement. I love how sensitive she was about it, trying to whisper her first briefing in order to not make him feel bad. She wasn't the only one in the business of making people feel better. Without any cases to keep them busy, Gus and Shawn - but mostly Shawn - decided to embark on a new business venture as a life coach with an acronym which does absolutely nothing to support his mission. In the end, it was clear that the only person it seemed to at least minimally influence was Lassiter. Then again, perhaps he was their most important client during the course of their very brief venture. It was good to see Shawn, Gus and Lassiter tracking down leads together. Perhaps the most entertaining of which was the one that led them straight to Trout's mom! I don't know what led to their hilariously dysfunctional relationship, but it made for good TV! Lassiter receiving life advice from Henry, only to proceed to issue him a ticket for a broken headlight - in the middle of the day mind you! Shawn thinking Lassiter was dying. Gus failing to shed tears at the thought of Lassiter dying. Hearing Franny, McNab's wife, for the first time! So, Psych-O's, do you think Carlowe is about to have a boy or girl? Boy Girl I'd rather not speculate, let it be a surprise! C. Charles is a TV Fanatic Staff Writer. Follow her on Twitter.